To germinate and raise young plants successfully in the winter months of January and February and avoid the spindly, leggy specimens normally resident on the windowsill in the past, Grow Lights are really the only answer. 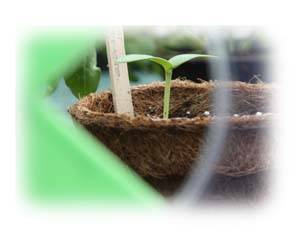 The reason seedlings without the benefits of artificial light grow tall and weak – commonly known as ‘leggy’ - is due to natural winter light; or more accurately the light quality and lack of it. Because the days are shorter this time of year and on the few occasions the sun does shine, the intensity of the light is not as it is in the spring and summer, so the plants grow tall and pale as they search for more light to enable them to photosynthesise and grow. It’s a little like what happens when you force rhubarb but nowhere near as extreme! The Grow Lights we supply come in single or double bulb form with spare bulbs also available. A single bulb kit will illuminate 2 full size seed trays and the double version covers 3, but plants on the periphery will also benefit greatly from this blast of supplementary daylight. It’s important to note the bulbs we supply are 6400K rated, giving the correct spectrum of light to propagate and grow on young plants. A special bulb to promote flowering (2700K) is also available, and without getting too technical, the ‘k’ stands for Kelvin, a measurement of colour temperature. Using the lights is not an exact science and there is no strict lighting regime you need to adhere too (unlike the commercial practice of raising cut flower crops such as chrysanthemums) but plants will plants rarely benefit from receiving daylight over 18 hours. It’s also impossible to ‘overdose;’ the plants on light but given the previous statement, it wouldn’t make economical sense to keep the lights on constantly. It’s also good practice to use the Grow Lights on a timer set for the morning and evening of bright sunny days to supplement the natural daylight, and the kit could be run off a light sensor to help illuminate overcast conditions. An 18 hour burst of light per day should be enough for propagation purposes buy as I said above, anything above this daily total is a waste of energy and money! Finally, you’ll increase your seedlings chances and of course their rate of germination by using a heat mat or propagator. The basal heat these two items generate greatly encourages germination and root growth and if you go for a ‘hi-rise’ model like the Vitopod, you can grow the plants on in gentle protective heat after germination.